I am literally obsessed with the Spiderweb design, so naturally, adore this gracefully contoured spiderweb ring with two bezel set diamonds by the very talented Jennie Kwon Designs. Each ring is individually made and this stunner is fittingly no1 on my classy but slightly spooky October wish-list. These beautiful black enamel and gold detail 'frends headphones' are gorgeous, they have been on my wishlist for some time but was leaning toward function and was considering some gold beats. The frends maybe more of a fashion accessory opposed to tech, but you do have to admit that they look stunning. As you already know I am a Gucci fan and adore their espadrilles. If you haven't already please do check out my bloom espadrille review which can be found here - I love these classic Gucci Signature leather espadrilles in black and the classic shoes would make a lovely addition to my closet. Ever since I let my stretched ear close up, I have been searching for a perfect pair of studs to adorn myself. This stunning Versace Medusa heads fit that bill. I adore Versace and these vintage looking studs are classic, gold and shiny = winner. Sticking with Versace theme these gorgeous classy pumps with giant gold Medusa head move me. I am a true shoe fiend and care not for comfort only design and so these stunning heels are high on my wishlist. Desperately trying to master the social media arts ... I have even resorted to self-help books to help my blogging full-time dream come true. I picked up this lovely book in Virgin Yas Island and am hoping to invoke Aimee to make my dreams a reality. Blogging is not easy but taking pictures is my passion. I'm currently considering removing all my pictures from my Instagram and starting my gallery a fresh, this is a lovely book with lots of practical advice and tips is helping me edge toward this decision. Still obsessed with all things marble, I have decided that my new gold MacBook deserves to be lovingly protected in this befitting gold marble case. I have searched high and low for a perfect MacBook cover and finally came across this gorgeous black and gold case on Etsy. Who doesn't love scented candles, here in Dubai we have an abundance of lux candles to choose from and usually gravitate to Jo Malone or the more affordable Woodwick Candles. I really do like the look of Diptyque candles, however, love to give them a try. and want to give this a new scent a try not just as a flay lay accessory. Another Versace item and nothing screams Versace more than the cult classic MEDUSA baroque printed silk scarf. The weather in Dubai is usually one speed HOT but this stunning classic silk scarf is sheer opulence and would look amazing as an accessory to my black capsule wardrobe. YSL makeup is lush in its shiny gold packaging, I love YSL makeup not just for the packaging as luckily enough the makeup is pretty darn good too! This Rouge Volupte Shine is going to look great in contrast to the black and gold theme and this perfect Autumnal hue Ambre Indecent will be lovely for our trip home to the UK mid-October for a few weeks! 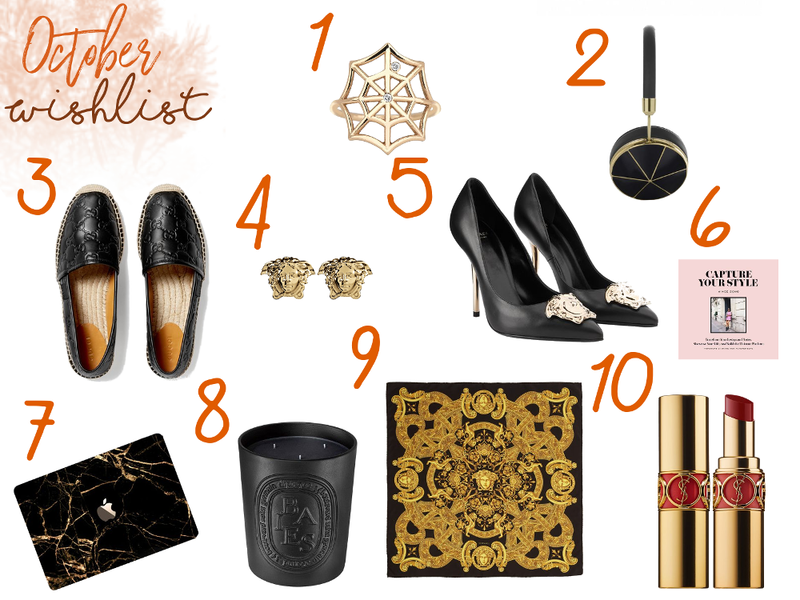 Hope you enjoyed my second instalment of my wishlist / monthly favourites!